The Nova NanoLab™ DualBeam FIB has high resolution electron (1.5nm) and ion (5nm) columns. The Nova is equipped with a Sirion™electron column with a Field Emmission Gun. It has high resolution capabilities with accelerating voltages ranging from 30kV to as low as 500V with an innovative "Through the Lens" detector technology. As of December of 2012 has been equiped with an OmniProbe AutoProbe™ 200 in-situ sample lift-out system. This allows the preparation of site specific TEM samples without the need for support films. The Nova has an integrated TSL EBSD package to allow for orientation imaging. The system also has "Run Script" and "Slice and View" scripting packages for 3-D reconstruction from serial sectioning (FIB-tomogrpahy) of the sample. The 3-D reconstructions are very important for understanding the the true 3 dimensional morphology of todays engineering materials. The Nova is equiped with light element EDS X-ray detector. The piezo electric stage is ideal for machining micro compression pillars for very small scale mechanical property testing. 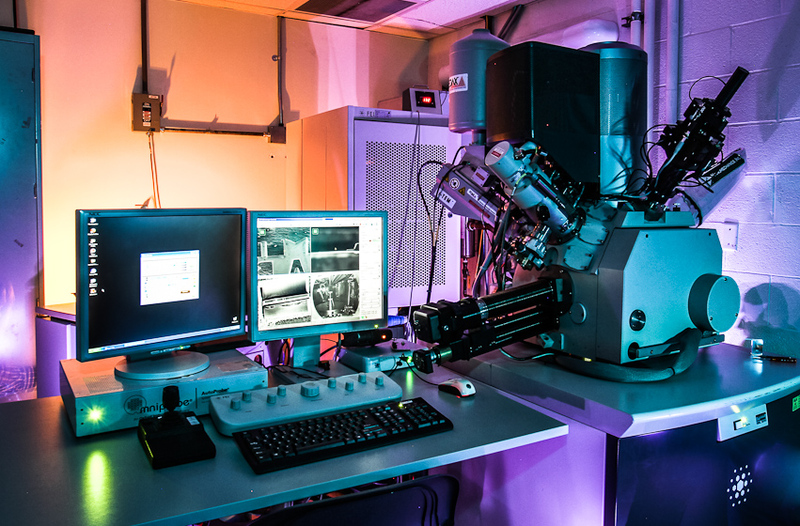 The Nova was recently equiped with a Nanomechanics InSEM mechanical properties microprobe. The InSEM features a precision nanomechanical actuator, which provides you with highly resolved force and displacement measurements. Now materials and micro compression pillar can be tested in situ even at elevated temperatures.